It has been a big few weeks of conferences and events for the team at Argon. We had the huge task of establishing the brand, building the website and designing various marketing materials for the 2015 Sub Summit held at the Adelaide Convention Centre. Next up, we attended the Clare Valley Professional Writers Workshop as a guest presenter to talk about the fundamentals of effective website design and development. And to finish it all off, we exhibited at the 2015 Global Business Camps in Sanctuary Cove, Queensland. Global Business Camps are 3 day long events, held annually, in which businesses from diverse backgrounds and experiences are educated by high quality industry professionals. Topics include business trends, marketing strategies, goal setting, finance management, customer service standards and general tips and techniques to help stimulate improvement and growth. Argon Design were fortunate enough to have a trade display, complete with banners, flyers and online website examples. The conference gave us the opportunity to network with different businesses from all parts of the country – contacts we wouldn’t normally have had the opportunity to meet outside of Adelaide. It was also great to get feedback on our portfolio – we received many comments on the standard of our design work and the build quality of our websites. All very positive stuff! As a sponsor of the event, Jason also gave a short presentation in front of the over one hundred strong crowd. A daunting task, which he pulled off admirably. Overall the conference was a success and a positive time was had by all. At Argon, we often piece together branded exhibition collateral for our clients to use at their events however this time the shoe was on the other foot, it was us who were attending! Being involved in the conference from behind the display table, rather than from behind the computer screen, certainly gave us a different perspective and we look forward to the next event! 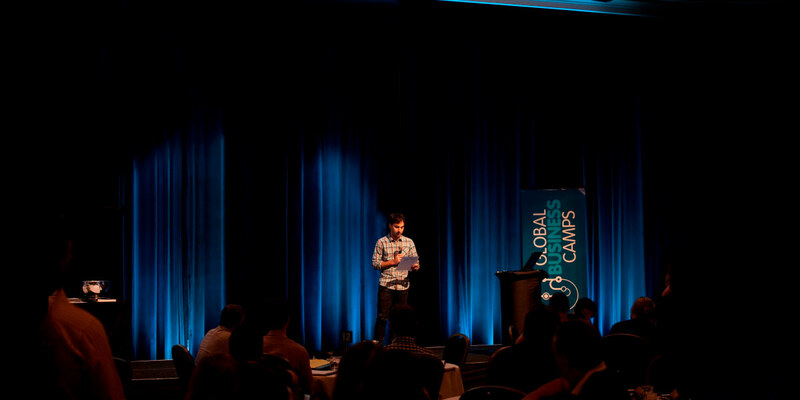 If anyone is interested in learning more about the Global Business Camps, check out their website or feel free to contact Jason to learn more about the experience. We highly recommend it to any business that is looking to improve or promote their services in a unique and relaxed setting. Stay tuned for more blog articles on the other great events we have been involved in!